A truly unique venue has opened in nearby Providence, Rhode Island. The concept and format is revolutionary, and incorporates aspects of a fine arts gallery with a craft work space, an artist supply depot, and a high-end thrift shop. This venue, called Waste Not Want Not, is the brainchild of recent Rhode Island School of Design graduate Laura Shirreff who states, "In a city where dumpster diving is a prosperous public past time and unemployment rates are the second highest in the country, it is my mission to make use of these unwanted but useful commodities to benefit local charities and the Providence community at large. 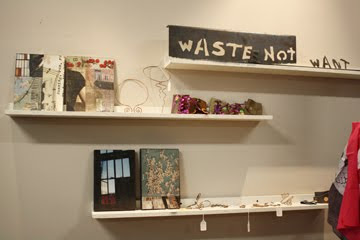 Waste Not Want Not is not your average thrift store or consignment shop. At the heart of downtown Providence it is dedicated to the local community and local organizations." And she means it. Within WNWN's 3,600 square feet of prime real estate space on stylish Westminster Street, in newly gentrified Downtown Providence, Shirreff has created areas of gallery, boutique, and shop. 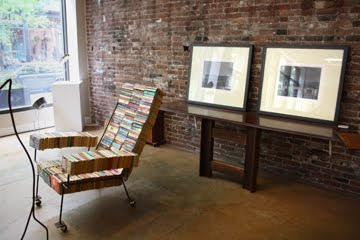 On view in the gallery are pieces of original sculpture and fine art which utilize found objects and reclaimed materials. 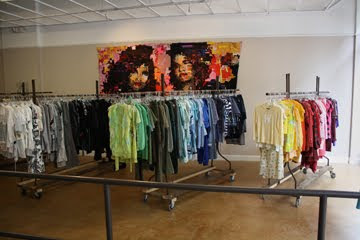 The boutique features clothing designed by local artists who upcycle pre-worn items into new treasures. The shop has racks of donated wearables divided deliciously into color categories, and bosts an impressive amount of vintage treats. The space overall is beautifully designed and has a distinct loft feel. The high ceilings are emphasized with soft sculpture hanging from rafters, and two free standing dressing rooms suspended by high-tension wires. Shirreff approached me in May at the RISD Alumni Sale about showing my artwork in her new space, and currently she is showing a few of my smaller photographic mixed media works (as seen above) and five larger pieces. The aspect of WNWN that fascinates me the most is that Shirreff makes all donated items available to artists and designers to use, at no cost, to create new garments, jewelry, art, or objects. Artists and designers are then expected to bring their new creations to exhibit at WNWN, and they will be made available for sale. 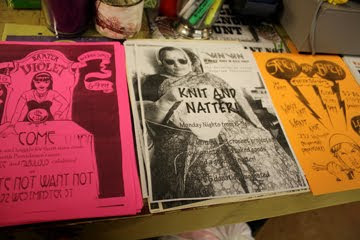 Fifty percent of sales go straight to the artist and fifty percent go to WNWN and supported local charities. Shirreff says, "In this way, artists and designers have easy access to raw materials as well as a convenient marketplace that will help to support and promote their own artwork. It also encourages not just recycling but upcycling of material goods and inspires people to be creative when regarding their own belongings before discarding them." In addition to the showing, selling, artist support, and community involvement, Shirreff has also programmed regular craft nights where all are welcome to create, chat, meet, and mingle. I'm verey pleased to have my work represented in Waste Not Want Not, and I look forward to seeing how this new venture develops. 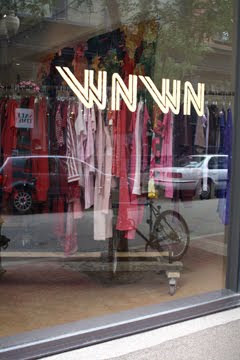 WNWN is located at 232 Westminster Street, Providence, RI 02903 and the hours of operation are: Mondays through Thursdays 10am - 6pm, Fridays and Saturdays 10am - 8pm, and Sundays 12pm - 6pm. This looks like a great shop. Will have to check it out the next time I'm down on Westminster.